It is time for another CASology challenge. Check out the latest challenge – Cross! My first thought was cross-stitch, but I didn’t really have time to stitch something nor do I have stamps for that. As I was going through my index, I saw the Road Signed set and decided I definitely wanted to use that. I bounced around the idea of not being literal and doing bright colors, but I just couldn’t…for some reason I wanted realistic. Originally, I was going to use pattern paper, but the blacks didn’t match and that irritated me. As I was reviewing my options for creating the crosswalk, I thought stencil paste would provide the right look – around me, road stripes always look well worn (though I wish my paste was shiny as that would have been even more realistic). To make the stencil stripes, I used a stencil that had lots of different width stripes. I picked one stripe and taped off the others. I stenciled the stripe once, pull off the stencil, cleaned it, and let the stripe dry and repeated that process to create all 4 stripes. For someone who doesn’t like techniques because they are messy or time intense, I was surprised I went this route – but I’m so happy I did. 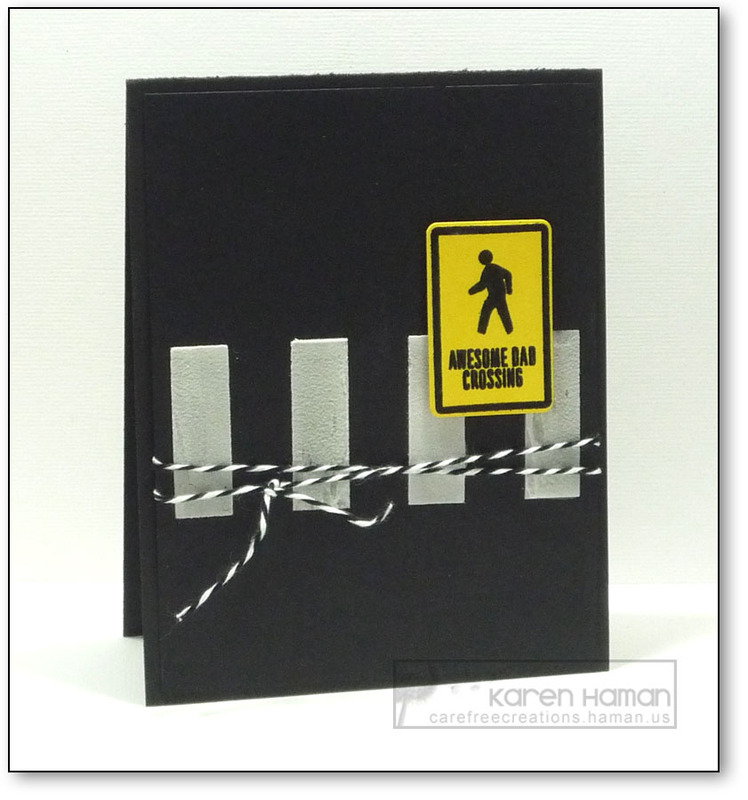 Once I had the crossing stripes done and the sign embossed, I decided the card needed one more touch – the twine. Absolutely love your crossing! So creative! Love your take on the cue word, Karen! My favorite of all the DT cards – brilliant!